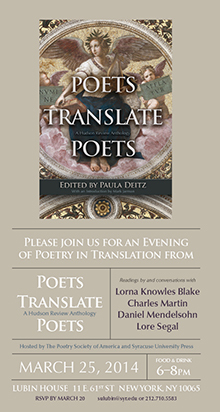 An evening of poetry in translation from “Poets Translate Poets,” a Hudson Review anthology, will take place Tuesday, March 25 at Lubin House, 11 E. 61st. St., New York, N.Y. The event, which will run from 6-8 p.m., is hosted by Syracuse University Press and the Poetry Society of America. The evening will consist of readings by, and conversations with, Lorna Knowles Blake, Charles Martin, Daniel Mendelsohn and Lore Segal. Food and drink will be provided. RSVPs must be made by Thursday, March 20, to sulubin@syr.edu or 212-710-5583.